LOS ALAMOS, New Mexico, May 3, 2011 (ENS) – Scientists at Los Alamos National Laboratory have found a way to avoid the use of expensive platinum in hydrogen fuel cells, the environmentally-friendly devices used to power automobiles. The researchers have developed catalysts that use carbon and inexpensive iron and cobalt instead of platinum for the part of the fuel cell that reacts with oxygen. Eliminating platinum, a precious metal more expensive than gold, solves an economic challenge that has thwarted widespread use of hydrogen fuel cell systems. Any increase in the demand for platinum-based catalysts could drive up the cost of platinum even higher than its current value of nearly $1,800 an ounce. In a paper published April 22 in the journal “Science,” Los Alamos researchers Gang Wu, Christina Johnston, and Piotr Zelenay, joined by researcher Karren More of Oak Ridge National Laboratory, describe the use of a platinum-free catalyst in the cathode of a hydrogen fuel cell. The researchers found that fuel cells containing the carbon-iron-cobalt catalyst synthesized by Wu not only generated currents comparable to the output of precious metal catalyst fuel cells, but held up favorably when cycled on and off. This use can quickly damage inferior catalysts. “The encouraging point is that we have found a catalyst with a good durability and life cycle relative to platinum-based catalysts,” said Zelenay, corresponding author for the paper. Hydrogen fuel cells convert hydrogen and oxygen into electricity. The cells can be enlarged and combined in series for high-power applications such as cars and trucks. Hydrogen fuel cells produce only water as a waste product and do not emit greenhouse gases. The carbon-iron-cobalt catalyst fuel cells effectively completed the conversion of hydrogen and oxygen into water, rather than producing large amounts of undesirable hydrogen peroxide. Inefficient conversion of the fuels, which generates hydrogen peroxide, can reduce power output by up to 50 percent, and also can destroy fuel cell membranes. 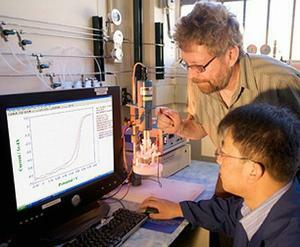 The new catalysts showed high power output, good efficiency, and promising longevity, the researchers said. The next step in the team’s research will be to better understand the mechanism underlying the carbon-iron-cobalt catalyst. Micrographic images of portions of the catalyst by researcher More have provided some insight into how it functions, but further work must be done to confirm theories by the research team. Such an understanding could lead to improvements in non-precious-metal catalysts, further increasing their efficiency and lifespan. Project funding for the Los Alamos research came from the U.S. Department of Energy’s Energy Efficiency and Renewable Energy Office as well as from Los Alamos National Laboratory’s Laboratory-Directed Research and Development program. Microscopy research was done at Oak Ridge National Laboratory’s SHaRE user facility with support from the Department of Energy’s Office of Basic Energy Sciences.